A fascinating pirate's tale with mystical creatures and elements of magic. 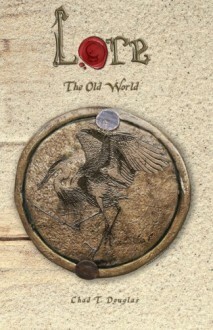 The Old World is the last installment of the Lore trilogy by the young and ingenious author, CT Douglas. The trilogy's first book, A Pirate's Charm, introduced the main characters and set the stage for this page-turner, pirate adventure. The story begins in 1780 in the island of Barbados, where gemseeker Molly Bishops is pursued by members of the dangerous cult of vampires, The Black Coats. After escaping her would-be captors, she forms an alliance with the infamous Captain Thomas Crowe, who allows Molly to join his pirate crew. During their voyages, she begins to understand Crowe's unusual crew, the prophetic riddles of an old fortuneteller, and her essential role in the fulfillment of those prophecies. The second book, East and Eight, presages and continues the epic. The narrative begins in Barbados in 1775, with young Thomas then a crewman enslaved by the ruthless pirate Captain Lapuente. Thomas gains his freedom by helping Oi'alli, the chieftess of the Oi'tan tribe, to recover a stolen talisman. As a token of gratitude, Oi'alli allows Thomas to keep the powerful talisman for five years. When Oi'alli comes to collect it and Thomas refuses to give it back as previously agreed, she curses him with a Doppelganger demon whose actions eventually force Thomas to travel to the island of Wallachia to be exorcised by a Helvetti priest. As the story unfolds, Thomas and Molly must form alliances with former adversaries to defeat a treacherous foe known as The Eight, a mysterious group persecuting the vampire and werewolf cults in the name of preserving humanity. The Old World begins with Molly's self-promotion to Captain following Thomas's death after the exorcism. The freedom of Molly and her crew, however, is taken away when Captain Jack Darcy, the vicious Blood Moon werewolf pirate, captures their ship and moves everything to his. He imprisons Molly, and her loyal companions Leon, Geoffrey, Chera, and Ine in separate cells in the lower deck while the rest of the crew is forced to help on the upper deck. Darcy has commandeered the ship to Mombasa, India where he will hand Molly and the other prisoners over to Udbala the Seventh, in exchange for a generous reward of gold coins. Although Molly's advanced pregnancy is affecting her sorceress powers, she still manages to escape from her prison cell. She scouts the ship unnoticed and gathers useful information to prepare an escape plan. In the meantime, Thomas finds himself at the Divine, a place between the worlds of the dead and the living, where he will re-experience all the important events from his past. Curious about where a silver thread attached to his body, leads Thomas follows it. As he travels around, he meets an African warrior and helps him to defeat a soul-eating demon. Later on, Thomas meets the fortuneteller from Barbados who Molly visited at the beginning of A Pirate's Charm. The seer shares with Thomas important information about The Eight and, by way of a riddle, tells him how to exit the Divine. Encouraged and hopeful at being reunited with Molly, he continues searching for the door of death, which leads to the exit. Suddenly he arrives at the place where all silver threads are connected. There he finds the Octopus. After an intense conversation, the Octopus is amazed and surprised that Thomas has not yet solved the riddle, so out of pity, he gives Thomas a hint at the answer. As the story unfolds, Molly, known by others as the “Angel sorcerer,” continually astonishes those who dare to challenge her powers and stand in the way of her freedom. On the other hand, internal turmoil within The Eight is interfering with its plans for global power. Will Thomas be able to find and cross the door of death and be reunited with Molly before it is too late? Will The Eight be able to reach its goals while eliminating the pouches of resistance growing in Europe? Is the dying Old World giving way to a rebirth in the New World of the Americas? Join Molly, her loyal companions, and the other underground resistance groups in their journey for freedom against the forceful, influential, and mysterious foe known as The Eight. The Old World was a tale as engaging as the first two books of the Lore trilogy. The narrative and fighting scenes were powerful and vivid, as expected. Molly's character evolution was surprisingly delightful. However, I found a key mistake that diminished the value of the whole. Nonetheless the unresolved ending leaves the reader wondering if the author is considering another series based on the trilogy narrator, Mr. Geoffrey Mylus. A highly recommended saga for teens, older readers, and for anybody who enjoys a fascinating pirate's tale with mystical creatures and elements of magic. The trilogy has all the elements to emerge as a blockbuster movie! 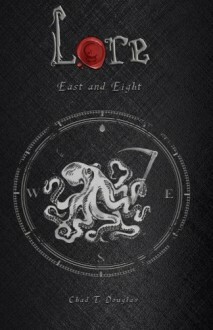 East and Eight is the second installment of the Lore Trilogy by the young and ingenious author, C.T. Douglas. The first book, A Pirate's Charm, introduced the main characters and set the stage for this page-turner, pirate adventure. The story begins in 1780 in the island of Barbados where gemseeker Molly Bishops is pursued by members of the dangerous vampire cult, The Black Coats. East and Eight presages and continues the epic. The narrative begins in Barbados in 1775, with young Thomas a crewman for the ruthless pirate Captain Lapuente, notorious for buying and keeping werewolves captive and controlling them with magic. Even as a young pirate, Thomas was a free spirit and a witty entrepreneur. He helps Oi'alli, the chieftess of the Oi'tan tribe, to recover the stolen Uyl Talisman from Capt. Lapuente. As a result of this successful recovery, Thomas regains his freedom and Oi'alli allows him to keep the powerful talisman for five years. Once freed, Thomas takes over Capt. Lapuentes's ship and crew and installs himself as captain. He develops a reputation as a tough, fair, and slick business man. When Oi'alli comes to collect the talisman from Thomas, he refuses to give it back as previously agreed. After an intense argument, she curses Thomas with a Doppelganger demon whose actions eventually force Thomas to travel to the island of Wallachia to be exorcised by a Helvetti priest. Before traveling to Wallachia, Thomas and Molly make a short stop in England. There, Molly's repressed powers as a sorceress are fully unleashed when she is engaged in a fiery fight for her life. Those newly discovered faculties will be essential for the salvation of Thomas and the success of their mission. During their journey to seek the assistance of the Helvetti priest, Thomas meets Geoffrey Mylus, a magi scribe whose knowledge and understanding of magic will be extremely beneficial to Thomas and those traveling with him in confronting some future ordeals. At this point, Geoffrey is formally introduced as the trilogy narrator. As the story unfolds, Thomas and Molly must form alliances with former adversaries to defeat a treacherous foe known as the Eight, a mysterious group persecuting the vampire and werewolf cults in the name of preserving humanity. The author skillfully shares key information about some of the Eight members, their locations, and hints at other suspected members. Will the Eight be able to reach their goal of global power? Will the cults be able to survive their power and political influence on the world of humans? East and Eight exceeded my expectations. Once again the author binds together new characters, situations, and places in a spider web of suspense and unpredictable revelations that kept me spellbound until the resolution of all conflicts. Join Capt. Crowe, Molly, Geoffrey, and the others on this cliffhanger of an adventure! I highly recommend this saga for teens, older readers, and for anybody who enjoys a fascinating tale with all the elements of a NY Bestseller converted into a blockbuster movie! 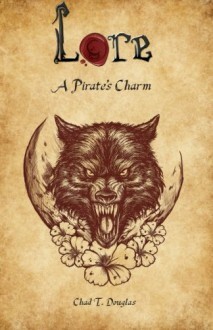 A Pirate's Charm is the first book in the Lore's trilogy written by the young and ingenious author, C.T. Douglas. The story begins in 1780 in the island of Barbados. During a stormy night, Molly Bishops is running for her life from a group of dangerous men wearing black coats. Her only hope is to reach the harbor and find a ship scheduled to depart that night. On her way, she finds momentary refuge from the rain and her pursuers at the house of a fortuneteller. After Molly enters the house, the old man's daughter brings her to a room where the fortuneteller lays sick in bed with an important message for the visitor. He grabs a pile of animal bones and few pebbles and casts them several times on the dirt floor as a mean to predict Molly's adventurous future which includes a sick werewolf. Aware that Molly is being chased, the old man urges her to flee his house. She continues her way to the harbor for the beginning of an odyssey that will change her life forever. At the harbor, the only seaman daring to navigate under the stormy conditions is the famous pirate, Captain Thomas Crowe. In her desperation, Molly forces her way onto his ship and negotiates for a safe voyage. After seeing Molly's pursuers in the black coats, Capt. Crowe allows her to remain aboard and, given her lack of pirating experience, assigns her to the kitchen. During their travels Capt. Crowe discloses important information to Molly including the truth regarding her father, a famous and distinguished gemseeker who she thought dead. Gemseekers were people whose oddly shaped irises gave them the ability to determine the magical capacity of a precious stone and use that power with spells, etc. He also teaches her how to read the different types of marine and star charts she'll need to decipher for Capt. Crowe a map hidden inside a gem. In the event that something happens to him, Molly must be responsible to lead his crew to their final destination. As the story unfolds, Molly begins to understand Crowe's unusual crew, the riddles of the old fortuneteller, and her essential role in the fulfillment of his prophecies. Toward the end of the book, Capt. Crowe must confront and fight against his brother Harlan in order to find relief from his sufferings and keep Molly safe. The narrative is captivating and full of details about Capt. Crowe's travels as well as crucial background information that helps readers understand all of the twisted paths the author will dare them to follow. A Pirate's Charm is a skillfully written epic with elements of One Thousand and One Nights, The Flying Dutchman, Pirates of the Caribbean, the Twilight series, and urban legends. The cliffhanger ending, will leave the reader eagerly awaiting its sequel, East and Eight. A highly recommended tale for teens, older readers, and for anybody who enjoys a fascinating tale entwined with action, suspense, and well structured and developed characters and situations. Douglas' trilogy has all the elements to emerge as a blockbuster movie!